To discuss our Signature Collection or inquire about ordering memo samples and fabric, please contact your nearest Brunschwig et Fils Showroom. The creation of Thatchers' Fine Timeless Fabric, and its exciting new collection, "Les Princesses," actually started with the desire to create the perfect upholstered boudoir chair. Becky Smith, owner and president of Thatchers' Fine Timeless Fabric, was inspired by her favorite chair, one that had been passed down to her through generations by her Great-Great-Grandmother, Babou Warfield, the founder of the "Warfield Shops, Inc." in the Central West End of St. Louis at the turn of the century. After Babou's husband died she opened an interior decorating firm whereby she traveled to Europe to bring back priceless fabrics, antiques and heirlooms for the fine homes of St. Louis. One of those items was a classically designed boudoir chair, constructed with impeccable European craftsmanship and covered with elegant and fanciful fabrics. While seated in just such a chair, Becky came up with idea for "The Thatcher" a bespoke chair; a timeless, well constructed, boudoir chair that a mother and daughter could share generation after generation. Becky knew from experience that the market lacked any such chair. The trend in the marketplace to produce oversized, cheap, foreign made furniture products left a void in the marketplace for a well constructed chair using traditional quality construction techniques: hardwood frames, eight way hand tied springs, jute webbing, horsehair padding, cotton wadding, hand tacking and muslin coverings. Seizing on the opportunity Becky decided to create just such a chair and immediately sought out the appropriate fabric. Again, she discovered a dearth of the type of fabric she was looking for, one that embodied the color, excitement and brilliance that Becky felt appropriate for a chair of this quality. Such a chair would be most appropriately covered with a cotton glazed chintz fabric with the timeless look of the preppy pink and green color combinations whimsically reminiscent of locations of Slim Aarons' jet set era of the fifties and sixties. But such a fabric did not exist in the market. Her appreciation for the artistic process in the creation of this classic fabric, led her to Key West, Florida. It was there, Becky met and befriended Martha dePoo, Suzie Zuzek dePoo and Leigh Martin Hooten, three of the original designers who created many of Lilly Pulitzer's original clothing designs in the 1960's through 1980's. Sharing with Martha and Leigh her ideas for a timeless chair and exceptionally high quality cotton chintzed fabric they agreed to provide her with new, sophisticated and vibrant designs, an offer Becky quickly accepted. Leigh, with Martha's support and encouragement, went to work on the designs that ultimately would be the first collection, entitled "Les Princesses" - whimsical, yet timeless hand drawn designs, which come from the head to the heart to the hand, featuring imaginative mermaids, florals and classic medallions. Producing the fabric with quality equal to the artist's designs and "The Thatcher" proved equally challenging. After literally searching the world for the best producers of cotton glazed, chintzed fabric Becky drew on her family history once again and identified a mill in Southern France that produced fabrics for her great-great-grandmother and for generations of sophisticated, discerning clients through most of the family-owned, high end fabric companies of the world. While on a family vacation to Paris, Becky managed to obtain an appointment with, and presented her designs to the owner of this mill, one of the best mills in the world. His excitement and enthusiasm for the designs and color ways lead to the finalization of the designs in Key West, hand engraved screens of the designs in Lyon, France and ultimately the production of the first run of the fabulously new Thatchers' Fine Timeless Fabric in France. The resulting fabric line can be described as a modern classic. 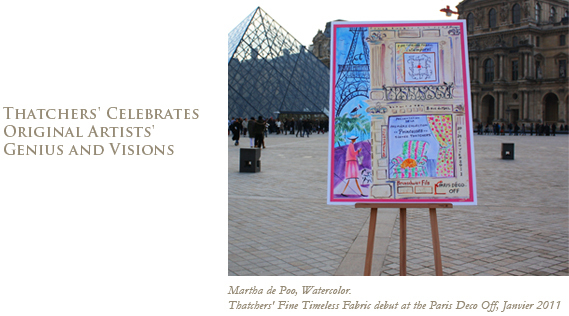 Thatchers' Fine Timeless Fabric was launched and presented its "Premiere Collection, Princesses" in the United States. It marries the whimsical design with the brilliantly imaginative color combinations and the quality fit for Versailles! Let the fabric speak for itself. Enjoy! Leigh graduated from the Moore College of Art in Philadelphia with a Bachelor of Fine Arts in Textile Design. She interned with Key West Hand Print Fabrics and was invited to return upon graduation. She worked closely with Martha dePoo and Suzie Zuzek dePoo, creating many designs for Lilly Pulitzer's clothing line in the 1960's through the 1980's. 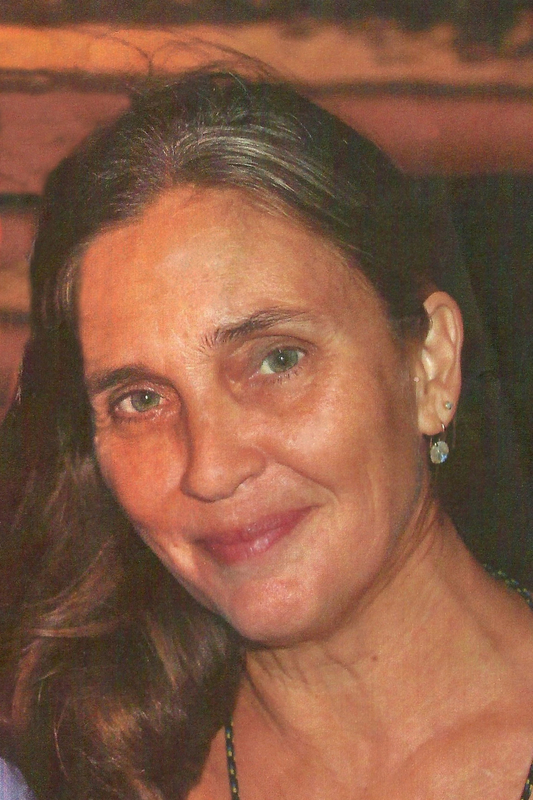 Leigh has remained an active textile artist working in New York, Philadelphia and Key West. Martha, a third generation Key West artist, is an accomplished water colorist, receiving numerous awards. She began her formal career as an artist for Key West Hand Print Fabrics in 1973, although her love of art began at a much earlier age. She credits the nurturing guidance of her mother, Suzie Zuzek dePoo. During her 12 year tenure at KWHPF, she received invaluable training in color and textile design and she created many wonderful designs for Lilly Pulitzer. See www.marthadepoo.com to learn more about Martha. After serving in the US Army during World War II, Suzie went to the Pratt Institute on the GI Bill. Here she majored in textile design and graduated first in her class in the late 1940's. In her prolific career as an artist and designer, Suzie has worked for the Herman Blanc Studios in New York designing upholstery and dress fabric; was the Head Designer for Key West Hand Print Fabrics, creating the majority of signature designs for Lilly Pulitzer for nearly twenty-five years; and, has worked in oils, acrylics, watercolor, stained glass, ceramics and multimedia sculptures. At 88 she continues to create works of art.